There are a few components to this, but none are terribly difficult. They just involve a LOT of eggs. 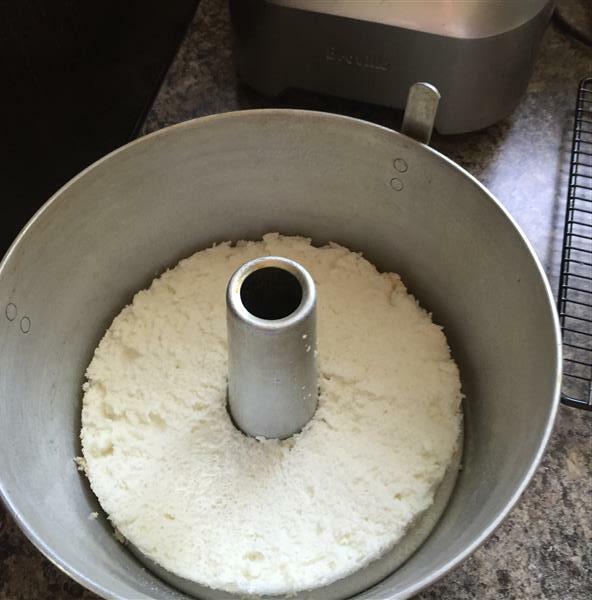 First, angel food cake. In this case, 16 egg whites’ worth. 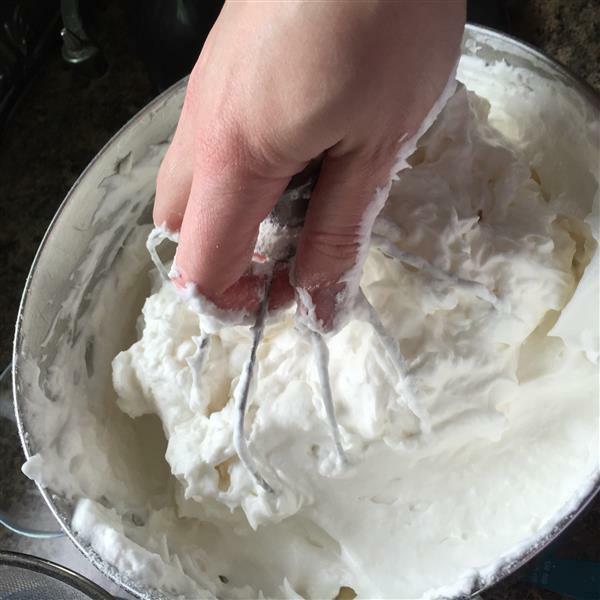 If you haven’t made an angel food cake, it’s basically a meringue, then you sift flour on top of the meringue, and gently fold it in. When I fold in the flour, I grab the whisk attachment from my stand mixer by the handle, and just use that. It can be a bit messy. 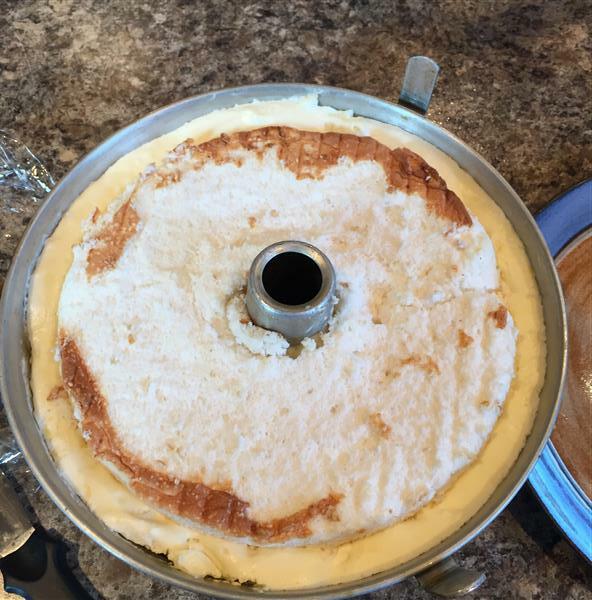 The only other remarkable thing about this angel food cake was that it came out really wet. After I’d let it cool upside-down, as you do, I removed it from the pan and found the edges quite goopy, which is probably why they stayed stuck to the pan for the most part. I ended up with a VERY white cake. The next component you need for this cake is a lemon curd. Fortunately, this uses a bunch of the egg yolks from the previous step.. but you need more whites for an Italian meringue, which is the final component. Oh, and there’s some whipped cream in there, too. I made the lemon curd on Saturday night, folded in the whipped cream, then left that in the fridge overnight. On Sunday morning, I made the Italian meringue, then folded that into the lemon mousse (curd+cream). Then added gelatin. Then composed the cake. Start by slicing the top and bottom off the cake and set them aside carefully. Then slice the middle bit in half again, then into little cubes. Or something vaguely like little cubes. 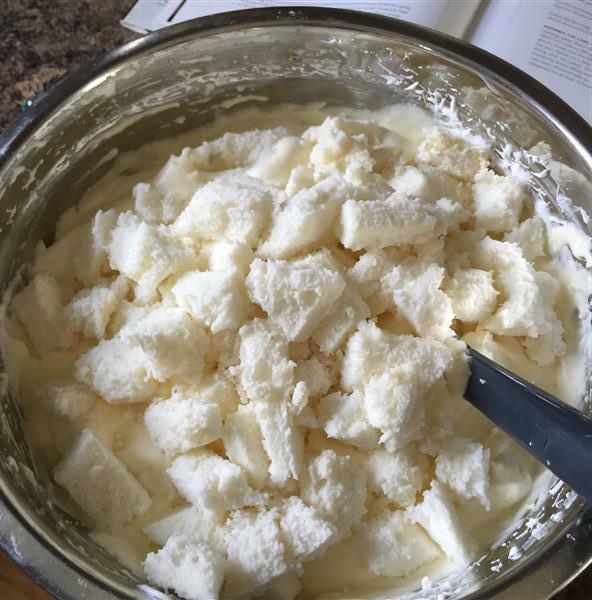 Then you stir the cubes of angel food cake into the mousse. This picture makes me think of Wonderbread, which makes me think of Communion. The strange associations we have in our heads, eh? 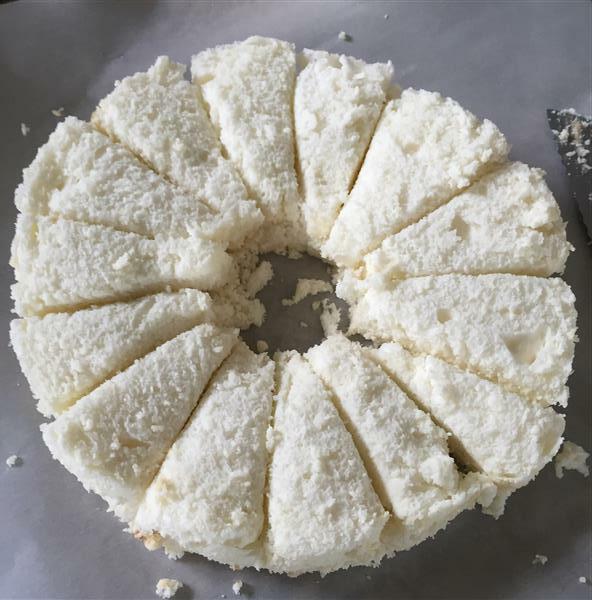 To put the cake together, you put the bottom of the cake back into Grandma’s angel food cake pan, then dump in the mousse+cake cube mixture, then put the top of the cake on top. This becomes the bottom when you serve it. I took a picture at this point, because I was convinced it was going to make a giant mess when I put the plate on top and flipped it. I even called our guests over to come watch me dump a tube pan full of eggs on the floor. It came out beautifully! It even served up beautifully! I was so excited by how perfectly the slices came out that I had to immediately post it to the Rose’s Alpha Bakers Facebook group. 😉 I took the tray of slices out to our friends gathered around the camp fire in the back yard, and it was devoured immediately. As I predicted, Jay loved it, and he’ll be taking any leftovers to his new team at work tomorrow. Today was a holiday, so we each had a second slice just now. 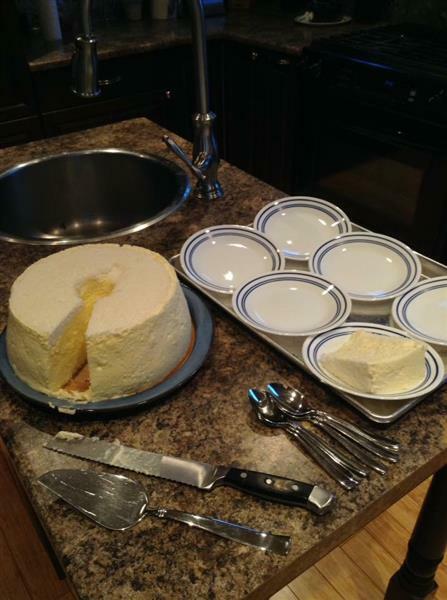 The soft angel food cake works really well mixed in with the lemon mousse. The texture of the mousse is perfect, too. Solid enough to hold together when sliced, but sooo soft and smooth. You can’t tell at all that it’s set with gelatin. I wonder if you could make a chocolate version of this somehow? 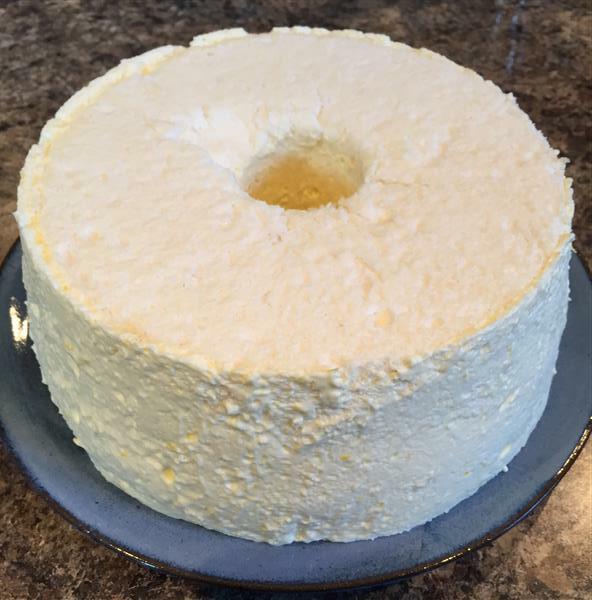 Posted on May 24, 2016 by KristinaPosted in The Baking BibleTagged angel food cake, lemon curd, lemon mousse. Wow. Congrats. It look beautiful. My cake failed twice. Yup,mine was goopy wet too, but the consistency wasn’t fluffy. I must’ve done something wrong. But yours looks gorgeous. What a great success on such a special day! I appreciate your pictures and explanations. This one seems a little be intimidating. It sounds delicious. Looks perfect!! I going to make one for a coming gathering..only I worry it will melt!